Cinder Jean Nooney, 57 passed away on Monday October 5th 2015 after a long battle with complications from leukemia. She was born September 21st 1958 in Torrance, California and lived in Manhattan Beach until she was 11. Her parents Jean Nooney Ill and Helen Marie Nooney moved to Goleta in 1969. She graduated from Dos Pueblos High School and attended Santa Barbara City College. She is now with her mother who passed away in August of 2015. She is survived by her brother Ross Nooney, (Sue Nooney) her father Jean Nooney and the long time love of her life Robert Thomas Bucy. She is also survived by her niece Melissa Gutierrez, (Armando) her nephew Robert Nooney, (Kelli) Her great nephew and nieces Blake and Madelyn Gutierrez and Reese Nooney. During her early teen age years she discovered her natural talent for music, poetry, songwriting and singing. These talents sustained her throughout her life where she entertained, traveled, produced CD’s and taught guitar lessons. “I have lived a very happy life and fulfilled so many of my dreams. Carry on please. In this life we are so resilient and can find our way back after loss. We can find new love and new friends. God designed our spirits to bounce back after a season of grief. Please hold me in your thought and minds. Don’t ever forget the fun times we have had together! Put photographs on your walls and remember always.” She and Tom shared a common interest in music, songwriting and entertaining together and are well known in the Santa Barbara area and the big island of Hawaii. She loved the ocean with all her heart and especially the crystal blue waters of Hawaii. 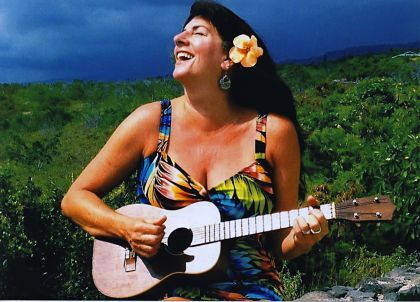 She was so grateful for the inspiration and love from the Big Island. She also shared the love and companionship of their four cats, Kimbe, Shelby, Pearl and Little One who are like family. “Remember, the music I have created in this world is who I am and needs to never be forgotten. Being a songwriter and performing my songs live on stage has given me the greatest joy in life and I know that’s why I was put on this earth. Writing songs, recording songs and performing them for people has been the most amazing thing ever ! I always want to be remembered as) Cinder Jeavinger/songwriter. My students are wonderful and I love them all. Ask them to keep on playing guitar and singing and carry the seed of music to the next generation of children.” She is loved by many and will be deeply missed. A celebration mass will be held at St. Raphael’s Church, 5444 Hollister Ave. Santa Barbara on Friday, October 23rd at 10am.